Fast fashion has become a new trend. Poorly made clothing at low prices line department stores. In this ever-changing world our clothing adapts to our fast-paced lives. We often do not think of what kind of effect we have on other people and the environment when we purchase something. When you buy from the wrong sources it can have serious, long-lasting consequences on our world. Fair Trade. We’ve all heard the phrase, but what does it mean in terms of clothing? It is a process by which workers from underdeveloped countries get paid fair prices for their products. Fair Trade is a good stepping stone to better business practices because it reduces sweatshop labor and pays workers in developing countries fair wages. Keep an eye out for Fair Trade Certified brands of clothing. While there are drawbacks to Fair Trade becoming the norm, the benefits help workers in larger, global companies. Unfortunately, smaller businesses often suffer because they cannot afford the minimums and make little profits. Also, it does not give the workers full agency in their craft and CEOs will make much more than the employee who’s paid the least. Determining what is best for workers and the environment is a highly nuanced topic. You should approach how you shop with caution, as there are many brands that are not as conscious as others. The exploitation of workers in the fashion industry is a widely known yet taboo topic and constantly neglected. Victoria Secret, for example, uses prison labor to make their products, meaning that people do not get paid a livable wage, even as citizens of the United States. Prisoners often make only a few cents to dollars a day. Brands such as Forever 21 and H&M also exploit workers in places such as China and Bangladesh and used to source from the Rana Plaza. The Rana Plaza, a commercial building in Bangladesh, which was a hub for most sweatshops and exploitation businesses, collapsed due to poor infrastructure. Over a thousand people died as businesses continued to profit off their backs Their families were left with no income or answers. The fashion and clothing industry desperately needs to make a changes to their practices for the environment and for the benefit of the workers. Supporting brands that work to create change in the world is how you can help making the fashion industry environmentally-conscious. That being said, not all of your favorite brands are bad! Transparency is key; if the brand tells you a lot about its business it is often for the benefit of the consumer (you!). If you take time to do your research you can find that even some of your favorite brands are making a change in small ways. Noah NYC is a men’s clothing brand based in New York City. One thing that is important to note is that Noah is not a sustainable company and it recognizes that on its webpage. The website has a section about why it is not sustainable but also how, as a company, it does its best to be responsible. Nonetheless, ideas about fashion and their contribution to the benefit of the industry is admirable. Noah NYC gets all their fabrics and textiles from ethically sourced factories and mills. Each one of the fabrics on its website has a story behind where they come from. Noah believes in fair pay for workers and donates portions of the company’s profits. Its donations contribute to non profits and causes such as Save the Children (provides Syrian refugees with education, shelter, and child protection), Direct Relief (provides hurricane relief to areas affected), and American Civil Liberties Union (a human rights organization). 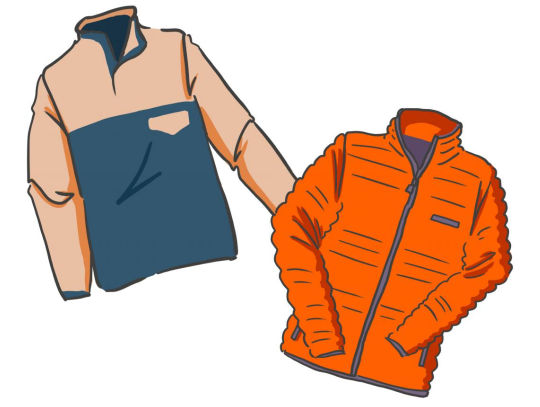 Patagonia is another brand that understands its impact on the environment. It believes in transparency and truth in its brand and marketing. With public information on living wages and fair trade to migrant workers and child labor, Patagonia tackles the hardest taboos in fashion and stands up to change them. Patagonia also shares all of their environmental impact information publicly, showing how conscious they are of our changing world. On it’s website, you can find information about its water use, energy use, and encouragement of activism among its employees. It is not about the product they have, but rather about how its products help people and make for a better world. Research your favorite brands and the places you shop from to make sure that it has ethical practices. Check to see if they donate to good causes and support wage equality. Research what you buy beforehand. Donate old clothes and buy used clothes at a Goodwill or local business. Look for brands made in the USA. Avoid buying items that are manufactured in China and Bangladesh, from which big businesses use child labor, exploit women in sweatshops, and underpay workers. It is necessary to recognize that it is nearly impossible for companies to be completely sustainable. With that, be a little more conscious about your own ecological footprint. Fight for wage equality and a positive environmental impact.